Where John James Audubon looked into the avian eyes of faraway migrations and lands unknown, Judith Vivell looks into the eyes of birds looking back. As of 2007, the cartographies of their homelands and chromosomes are drawn; their wild lives are cuffed by anklets with microchips, and their mystery has been thoroughly dissected. The future science of birds, of birdwatchers, is a diminishing frontier, as is the natural home of the flighted population. Vivell's subjects stand not so much on the threshold of vast wildlands, as they stare out onto a burgeoning frontier of suburban sprawl. Their eyes no longer retain the enigma of the natural world—a boundless expanse beyond the outposts of human civilization—but a fear, a resignation to the end of Green earth. Contrary to naturalist illustration, Vivell's birds look out at us—standing in the gallery with our cell phones in our hands—and they are afraid. They know that the worlds behind them are shrinking and flat, and they are deadpan returning the gaze of their predators, their executioners—and they are waiting. 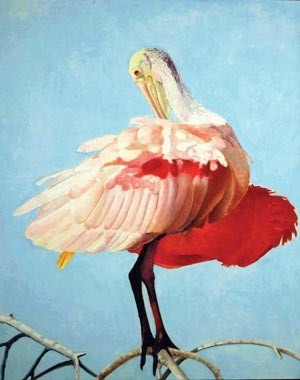 The twenty-one oil-on-linen paintings of Vivell's The Bird Series bring to mind Ann Craven's floral and fauna bird portraits; but the wide brush strokes, multiples and repetitions, and pop culture references of Craven's work are absent from Vivell's lexicon. Brushmarks and underpainting—invisible to digital reproduction—point Vivell to the industrialism of early and mid-twentieth century illustration—The Sunday Post, The Hardy Boys—with the result that the paintings strike the viewer more as paintings about the subject of naturalism, than paintings with the subject of naturalism. Duncan Hannah, with his end of empire rehashes of 50s boy's adventure drawings, might be invoked. "Kitsch" is not the concern; rather, it is an address of Empire/Superpower romanticism. Without sentiment, the paintings lay bare the sentimental. For an oeuvre that often takes the exactitude of Albrecht Durer as assumption, Vivell (whose daughter, a writer, Cassandra Neyenesch, contributes to the Rail's Art section) is remarkably unconcerned with every last feather. The attitude is all there—pride, majesty, despite the inevitable fall. Portraiture, regardless of its own evolutions, continually evidences itself as a capturing of a time period's outlook—from posture to politics. Vivell's birds, while a variety of identifiable species, are first and foremost contemporaries of one another. Durer's birds are also haughty—but the haughtiness that Vivell catalogues is more defiant, more desperate. With the wild kingdom in a state of global chaos—elephants and baboons on a global tear—it is difficult to maintain that interspecies discontent is unreal, that it is a form of human anthropomorphizing. In New York City, one hundred and fifty years ago, there was a bird called the Passenger Pigeon. It was the most populous pigeon in all of North America, probably the world. When flocks flew overhead, the sky would blacken—for hours, for days. The last Passenger Pigeon died alone in a zoo in 1914. Today, in 2007, New York City is seriously considering a law that would make feeding the pigeons illegal. To know animals is to apprehend that they understand far more than we give them credit for; that is of course the tragedy, that they know too much, that we know too little. To tag Vivell as an environmentalist painter is reductive, but one cannot come at the avian subject—as viewer, as painter—without acknowledging our own predilections to darken the sky … maybe for much longer than hours or days.